Think of stylish portable audio devices and up comes the name of the SkullCandy range of headphones, audio backups, earphones and what not. Designed to provide satisfactory sound suppression and clarity of sound, the headphones give comparative fight to its higher priced, high end adversaries in the industry. Affordable, versatile and durable, the INK’D Earbuds rangeare on their way to becoming the low range equivalent of best in ear headphones in the market. The trendy Skullcandy INK’D Earbuds S2INCB-008 that come in Black or Chrome is designed to cater the best possible sound quality across the spectrum. With silicon earbuds that come in multiple sizes to ensure a snug fit, the product aims at becoming one of the best noise cancelling headphones available in the market. Made of strong hard plastic, it is light and the wires do not tangle easily where the yoke length is adjustable via a slider. The tonality maybe slightly harsh on the ears if the volume is set to high. However, with low to midrange volumes, the performance is smooth. Efficiency is comparable to that of full sized headphones, with clear sound across the board. The Skullcandy INK’D Earbuds S2INCB-008 earphones are made of plastic with 3.5mm gold-plated plugs. 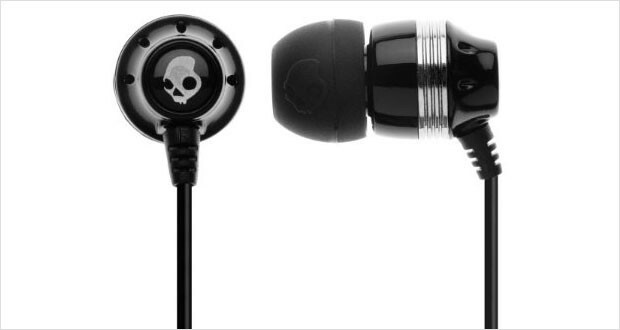 Though the plastic may make it look cheap, the design is chic with the SkullCandy logo imprinted on each bud for extra oomph. The additional pairs of gel tips provide flexibility to the user with regards to fit. R and L are engraved on each stem to indicate relative positioning of each bud. Dimensions1 x 1 x 1.5"
The rubber coated wires might be a far cry for the 100$ items available in the market, but are not flimsy. The stoic product provides for considerable wear and tear. Lightweight, with snug and pliable silicon earbuds that stay put, the product offers maximum comfort, even during workouts or travelling. The highs are crisp but some might prefer treble enhancers. Bass response is tight, but less prominent as compared to bass heavy models of Sennheisers. The noise reduction is satisfactory with the suitable pair of silicon buds. Sound is compact and solid. Overall, the sound is well balanced with effective noise reduction with the help of the rubber earbuds. Skullcandy INK’D Earbuds S2INCB-008 delivers on the sound quality though lifespan might be a cause of concern in some cases where shortening of the internal wire at the plug takes place. Considering the price and the warranty though, it is a decent buy for rough use.